Materials oxidize when free oxygen electrons (free radicals) attach themselves to the molecules that make up the material. For example, in a molecule of iron, oxidation takes the form of rust. In a living organism, it appears as inflammatory or allergic type reactions. This is known as oxidative stress, which is behind many diseases and various physiological disorders: cardiovascular problems, diabetes, cancers, degenerative or autoimmune diseases such as various forms of arthritis, multiple sclerosis, Crohn’s disease, etc. Antioxidants inhibit oxidation of various biological substances in the organism by neutralizing the free radicals responsible for oxidation damage. As an analogy, you can think of antioxidants as rust protection for your body. Over the past two decades, scientific research has shown us that oxidative stress is associated with aging and the onset of chronic diseases.1 The data we have accumulated to date indicates that physiological oxidation accelerates the aging process and contributes significantly to the onset of various diseases stemming from degeneration of the functions that normally maintain a healthy body. This is why antioxidant substances that can counter the harmful effects of free radicals are so important. By providing the body with antioxidants, we help prevent the onset of chronic degenerative diseases by counteracting the root cause of degeneration: oxidation and physiological stress. In a person already affected by disease, an adequate supply of antioxidants will help to halt progression of tissue and function degeneration, and facilitate the return to health. The effectiveness of antioxidant substances can vary, both in terms of antioxidant power and how well they are absorbed by the body. In addition, some highly concentrated extracts may contain residues of other harmful substances, such as agricultural, environmental and industrial pollutants. Because we manufacture the extracts in our antioxidants ourselves, we take great care in choosing the raw materials and ensuring the integrity of the extraction process. The primary ingredient of Annedda ANTIOXIDANT+® is white pine bark extract standardized to 95% proanthocyanidins. The bark comes from trees of the eastern forests of North America, away from agricultural, air and industrial pollutants. 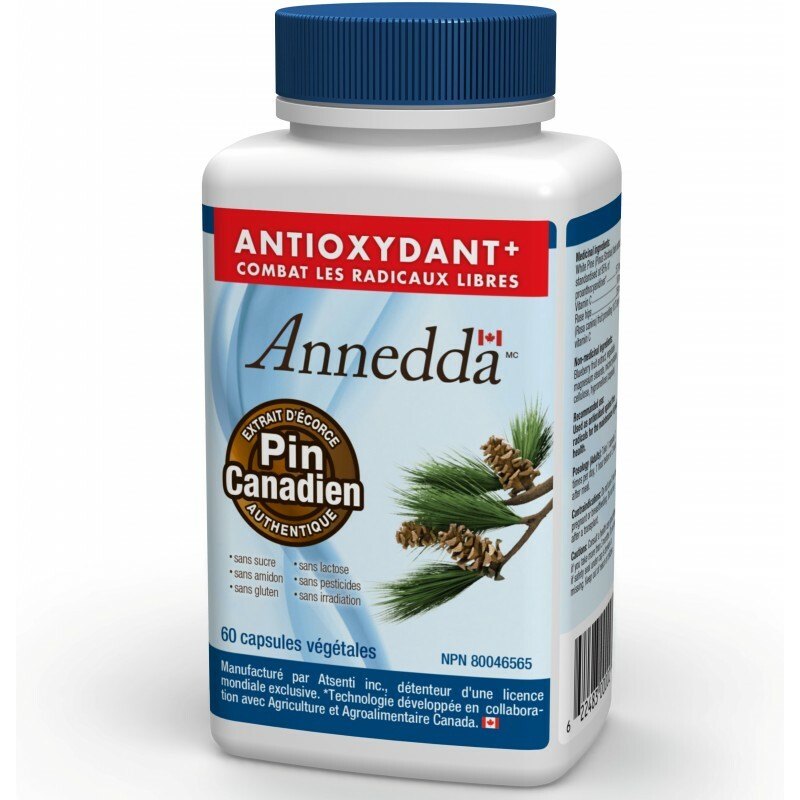 Our proprietary, all-natural extraction process is the subject of an exclusive worldwide license issued in 1997 by Agriculture and Agri- Food Canada2 for the extraction, purification and isolation of active substances in white pine bark (Pinus strobus). 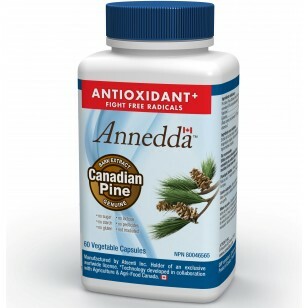 This is the Annedda® flagship extract, an exceptional antioxidant and the best in the world in its category. This product also contains the fruit of the wild rose, rosehips (Rosa canina). This fruit is naturally rich in vitamin C, another antioxidant whose properties are well known. Blueberry extract, vegetable magnesium stearate, microcrystalline cellulose, hypromellose (vegetable capsule). Used as an antioxidant against free radicals for maintaining good health. Consult a health care practitioner if used beyond 3 months.